I get so excited when my favorite authors break into hardcover. In fact, I'm pleased as punch to shell out the bigger bucks because it means that the awesome I've been basking in for awhile now has finally caught on and is being recognized on a wider scale. 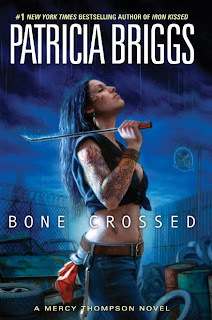 So it was, in a word, thrilling to open up the package from Penguin and see the words "#1 New York TimesBestselling Author" atop Patricia Briggs' shiny new hardcover Bone Crossed. I didn't smell vampire, only blood--fading as the frost had faded. I had seen the ghost--not clearly, but it had been there. Still, I turned so Chad couldn't read my lips. "Do you think Blackwood is playing ghost?" Stefan shook his head. "No, it's not the Monster. Wrong heritage. There was an Indian vampire in New York--" He looked at me and grinned. He pressed a finger to his forehead. "Indian with a dot, not a feather. Anyway, he and his get all could have done something like what we saw tonight. . .except for the cold. But only the vampires he made directly could do it--and he only made Indian women into vampires. They were all killed a century or more ago, and I think Blackwood predated him anyway." Chad had been watching Stefan's mouth with every evidence of fascination. He made a few gestures, and Stefan signed back, saying, "They're dead. No. Someone else killed them. Yes, I'm sure it was someone else." He glanced at me. "Want to explain to the kid that I'm more a Spike than a Buffy? A villain, not a superhero?" I batted my eyelashes at him. "You're my hero." He jerked several steps back from me as if I'd hit him. It made me wonder what Marsilia had said to him while she'd tortured him. He turned back to us with a hiss and an expression that made Chad back into me. "I'm a vampire, Mercy." I wasn't going to let him get away with the morose, self-loathing vampire act. He deserved better than that. "Yeah, we got that. It's the fangs that gave it away--translate that for Chad, please." I waited while he did so, his hands jerky with anger or something related to it. Chad relaxed against me. Stefan continued signing, and said, almost defiantly, "I'm no one's hero, Mercy." I turned my face until I was looking directly at Chad. "Do you think that means I won't get to see him in spandex?" Chad mouthed the last word with a puzzled look. Stefan sighed. He touched Chad's shoulder, and when the boy looked up, he finger-spelled spandex slowly. Chad made a yuck face. "Hey," I told them, "watching good-looking men run around in tight-fitting costumes is high on my list of things I'd like to do before I die." Stefan gave in and laughed. "It won't be me," he told me. Clearly, Stefan really stole the show for me and it was good to have him back after his rather conspicuous, though necessary, absence in Iron Kissed. His friendship with Mercy remains a highlight of the series for me. If you haven't guessed by now, these books are hands down my favorite urban fantasy series out there. I am ridiculously fond of them. And a big reason why is the nimble way Ms. Briggs walks that infinitesimally fine line between keeping things interesting and staying true to her characters. Beset on all sides by the supernatural, the macabre, and the horrific, her characters continue to feel so real to me. Like I could step into their world and accept it lock, stock, and barrel because Mercy's there in her garage. And what could be more normal than that? Bone Crossed had the same gritty feel that Moon Called had, as well as the dry humor and breathtaking timing of Blood Bound. Being the fourth installment, these characters know each other pretty well by now and so the interpersonal issues swirl around the arc of the mystery, lending it a richness you'll want to sink your teeth into. This series has it all. Good guys worth fighting for. Bad guys worth having nightmares over. And a heroine who can handle them all. More. Please. I really love these books too! I skimmed, because I don't want to be spoiled - but I am so looking forward to this one! And while I'm super-pleased she is being recognised as an author who can shift those hardcovers, I'm going to get the UK paperback edition because well, it's cheaper. Though I really really love the US cover. Wonderful review Angie! And I completely agree with you. Patricia Briggs writes the best, wholly genuine characters around. Mercy is probably my favorite UF/paranormal heroine. Scratch that, probably one of my favorite heroines, period. And the hardcover is so pretty. *strokes cover* My preeeecious! Forgot to also say, impeccable timing for your review ;) Great minds and all that! Hehe. Awesome review, Angie. Both you and Thea completely capture what I, too, love about Mercy and her world. I'm glad to see Stefan back in the main story line of this installment. In my heart I just know he would do what he had to to protect Mercy, but there's always this mysterious, kind of blurred line between his good vs. bad intentions regarding everything else that keeps me on my guard, you know? Hagelrat, what's not to love? They're just so good. Li, skim away! I'm always intrigued by the UK covers and wish I could have one of each sitting cozy on my shelves. Christine, absolutely. And I think Mercy feels the same way. I, too, just know that Stefan is one of the good guys. He's conflicted and shadowy about many things but Mercy is not one of them. Where she is concerned, he knows where his priorities are. And that's why I love him. Chelle, it's definitely a good sign. :-) Happy reading! Yes, they seem less transient somehow. As if they're really there to stay. Great review- you put to words my own thoughts. I love the Mercy Thompson series because I feel like I know these people - they are real in my head. :) Very few books are "book shelf worthy" in my home and this series has made it to my bookshelf which is a rare fete. Heather, that makes me happy. I'm glad they're keepers for you, too.